It was only recently I learnt that the blooms of the sponge gourd are edible. I do have a fascination for edible blooms but in my part of the world they seem to be available in winter. Like nasturtiums and pansies. I’m growing this gourd now and if I had sowed the seeds earlier I would have been using the flowers from the beginning of summer. But better late than never. The first batch of gourds I picked from the vine went into a simple fish curry. Since then they are being added to other dishes. The sweetness of vegetables that come from a fresh harvest makes meals so enjoyable. I made a simple salad today but the sunshine yellow blooms made a wonderful difference to that otherwise would have been an ordinary salad. 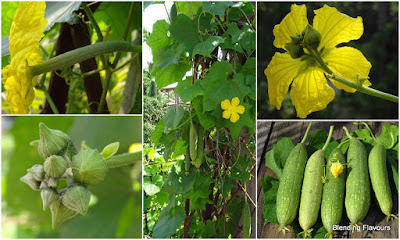 The sponge gourd has both female and male flowers. Whereas the latter drops off, the female flowers remain attached to the developing fruit. The young leaves and clusters of buds are also edible but I haven’t tried them as yet. Let’s move on to the salad. Add all the above the ingredients in a small jar. Cover with a lid and give it a vigorous shake. Set aside till the salad ingredients are ready. Peel off the skin of the cucumber. Use a peeler and create ribbons from the flesh. Do that on all sides till you get to the seed area. Leave that portion. Halve and core the apple. I left one side with the skin on and peeled the other half just because the skin looks good on a salad. Drizzle the lemon juice on the cut apples so that they do not turn brown. Add the rest of the ingredients except the last two…micro greens and the blossoms. Add the dressing and mix well. Transfer to a serving platter and garnish with the micro greens and the sponge gourd blooms.